THE reliability and accuracy of performance data is a high priority for Blackmore Wagyu, one of the pioneers in genomic testing and research in Wagyu in Australia. 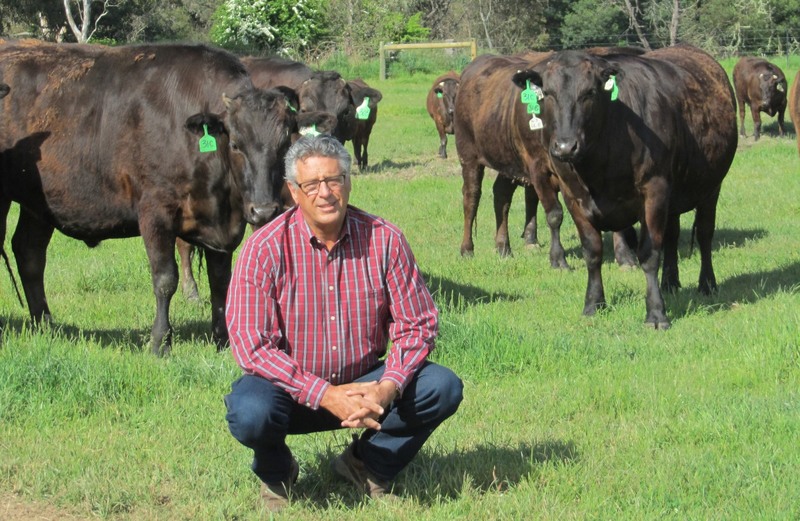 One of the nation’s best-known Fullbood Wagyu genetics and branded beef program businesses, Blackmore’s benchmark for accuracy, before any data is released, is 70 percent – the same as the dairy industry. It was after discussions with various genomic laboratories around the world that Blackmore signed a contract with the Victorian Department of State Development, Business and Innovation, through its Biosciences Research Division for Genotyping Services back in August 2014, to begin researching the genomic profile of its Fullblood Wagyu herd. Since the early 1990s Blackmore had collected and saved the DNA, (principally through hair samples) of the majority of the cattle it had bred, raised and processed. “This was like gold for the researchers, as there was a large store of historical data on animals that could be profiled,” principal David Blackmore said. Blackmore now has more than 12,000 animals in its database, which includes its foundation animals, the direct descendants of animals born in Japan. Mr Blackmore’s daughter Danielle has designed and developed the business’s own database, started in 1993, which records all breeding traits, including fertility, birth weights, weightgain, all maternal traits and follows through with the performance of animals on feed, and the carcase traits on each animal (graded by AusMeat assessors), which are linked to a three-generation pedigree. It was after discussions with the organisers of BreedPlan in 1996, (after collecting a significant amount of F1 carcase data), that Blackmore decided to organise its own progeny test program, with the help of a prominent Japanese researcher who was involved with the progeny test program in Japan. “He first visited us in July 1997 and again the following year, and we were lucky to be able to visit him at his workplace and his home twice in Japan,” Mr Blackmore said. As a result, the following table, produced in June 2013, was providing data with a high amount of reliability. “This table shows only the bulls that we used, that were exported from Japan,” Mr Blackmore said. He said it was important to note that this data reflected how those bulls performed in the Blackmore herd, under its own management, production methods and feed ration. “They may perform differently under different conditions,” Mr Blackmore said. However a direct comparison between the bulls’ progeny data does have a high degree of reliability, as all carcases have been raised under the same method of production. Earlier this month Blackmore received the last round of results from its genomic research. “We now have a genomic profile on 4815 Fullblood Wagyu cattle imputed to 800K SNP,” Mr Blackmore said. This includes 2996 graded carcases, 88 bulls (21 Japanese-born and 67 home bred), and 1731 females. The following table shows the result of the original Japanese exported bulls that Blackmore used in its herd that have accuracy higher than 70pc (the dairy industry’s benchmark for accuracy before data is accepted). Mr Blackmore said the prominent sire Itohana 2 would have his profile in the next research run. “The other original Japanese bulls not included in this data were either lightly used, or not used at all, after the performance of their F1 progeny carcasses in our herd,” he said. Worth noting at the top of the table, are Blackmore’s herd average genomic GEBV’s. “We will maintain a rolling base as more animals are profiled, they will be added and the herd re-averaged,” Mr Blackmore said. All the bull profiles are a direct comparison to the herd average. The accuracies are calculated using the same method as used by BreedPlan. He said it was interesting to note that one of Blackmore’s best foundation cows that produced 24 carcases 100pc MS 9+, was now minus-rated against today’s herd average. “At first I thought this can’t be correct, but on looking further, I was able to understand that this reflected the genetic gain we had made in our herd since we started,” he said. Great information to use as a high light beam guide in regards of how to get the best on the wagyu breed abroad the coutnries entreprenouring into this marvelous breed. Thanks from Colombia South America. All the big tech firms are influencing data-driven decision making. Every industry is scrambling to get their data sets organised to get better insights. The is a real differentiator for the Blackmore Wagyu brand. A good chance to discuss what drives the accuracy of GEBV (and EBV)! In the table, Itozurudoi TF151 has the highest accuracies. He has 325 progeny with good records for Marbling, EMA and so. From this progeny data alone, we would expect his accuracy of GEBV to be sqrt(n/n+a), where n is the number of progeny, and a is (4 – trait heritability)/(trait heritability). The heritability for marbling score and quality traits is high, say 0.5. Using this little formula, Itozurudoi TF151 will have an accuracy of 0.99, which is similar to the accuracies in the Table. So practically all the accuracy of GEBV comes from the very impressive number of trait records on progeny of this bull. The accuracy of GEBV is also made up of contributions from pedigree and genomic information. For young bulls with no progeny with trait records, these are the key drivers of accuracy. The size of the reference population,the number of animals with SNP genotypes and records for marbling and the other traits, determines the accuracy from the genomics. With a reasonable size reference population (thousands of animals measured and SNP genotyped) , the accuracy from the genomics might be the equivalent of a bull having 10 progeny measured for the trait. Using the little formula above, and for a trait with heritability of 0.5, this would give accuracies of GEBV of around 0.7. But of course the advantage of the GEBV is based on the genomic information is that bulls (and heifers) can be evaluated at birth, or as soon as it is practical to take a sample (even evaluating embryos with GEBV is possible). The AWA had a 75% accuracy threshold for reporting but this was taken away around 2012. Members are continually advised to look at the accuracy as EBVs with low accuracies are only indicative and most understand that. Another great story, Jon. Thanks to Dave also for exposing more of the story of Wagyu. I’m looking forward to the sequel. Some subtly worded messages about accuracy in this for BREEDPLAN and the AWA.